Try this delicious yet simple salad recipe. This recipe is a combination of potatoes and chicken and it is a great appetizer or snack. Most of the time when we think of making a chicken salad, we always use pasta like macaroni. 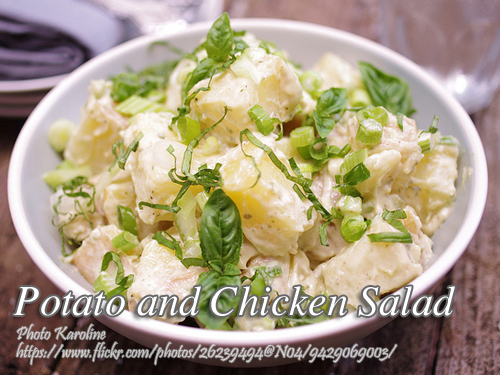 But if you want to try something different, you can use potatoes instead by making this potato and chicken salad. To make potato and chicken salad; Slice and dice the cooked potatoes. Add chicken and sprinkle with celery, pimientos, onions and pickles. In a bowl stir together the pickle juice and mustard. Gradually stir in mayonnaise. Mix with chicken and potatoes and other ingredients. Mix thoroughly and season with salt and pepper to taste. Chill for several hours or overnight in a covered container to allow flavor to blend. Slice and dice the cooked potatoes. Add chicken and sprinkle with celery, pimientos, onions and pickles. In a bowl stir together the pickle juice and mustard. Gradually stir in mayonnaise. Mix with chicken and potatoes and other ingredients. Mix thoroughly and season with salt and pepper to taste. Chill for several hours or overnight in a covered container to allow flavor to blend. Serve cold.